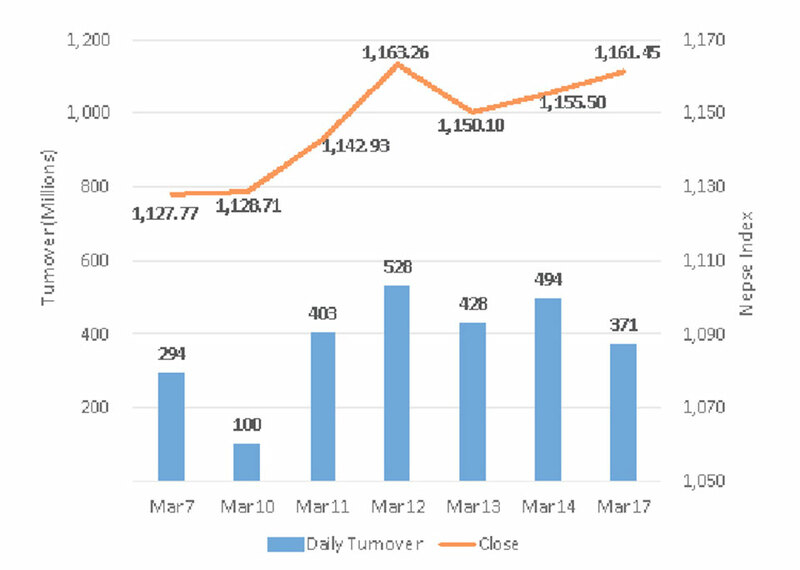 KATHMANDU: Local equities began the week's trading on a strong note as the Nepal Stock Exchange (Nepse) index rallied almost 10 points in the initial trading hour Sunday. The index retraced slightly after mid-day but maintained a slight positive bias throughout the day. Nepse witnessed flat trading for most of the remaining session to close the day 5.99 points higher at 1,161.45 points. The exchange witnessed a total turnover of over Rs 371 million on the day. Despite a slightly subdued market activity compared to recent sessions, investors seemed upbeat during the day's trading. Following two consecutive days of advances, the index has erased most of its Wednesday's losses. In terms of sectoral performance, most of the sub-indices ended the day in green. Only Hotels, Development Bank and 'Others' sub-indices posted losses of 1.16 percent, 0.32 percent and 0.1 percent, respectively. Among gainers, considerable strength was seen in Manufacturing & Processing stocks as the group's sub-index shot up by 1.77 percent. Finance sub-index also registered a gain of 1.13 percent. Next sub-indices of Life Insurance, Hydropower and Banking sectors closed around 0.8 percent higher each. Promoter shares of Shine Resunga Development Bank Ltd witnessed a total turnover of over Rs 44 million. Commercial bank stocks followed suit as shares of Nepal Investment Bank Ltd and NIC Asia Bank Ltd posted transactions of over Rs 29 million and Rs 15 million, respectively. Further, shares of Upper Tamakoshi Hydropower Ltd, Nepal Life Insurance Company Ltd and Life Insurance Co Ltd registered turnovers of Rs 14 million, Rs 13 million and Rs 10 million, respectively. Among gainers, shares of Asha Laghubitta Bittiya Sanstha Ltd continued its surge and hit the upper circuit of 10 percent. Similarly, United Finance Ltd extended its gains for a third consecutive day. Its share price jumped over 9 percent. Shree Ram Sugar Mills Ltd and Radhi Bidyut Company Ltd posted advances of over 8 percent and over 7 percent, respectively. Janaki Finance Ltd, Sindhu Bikash Bank Ltd and Karnali Development Bank Ltd were among other top gaining scrips. Conversely, shares of Tinau Development Bank Ltd suffered the most as it saw its share price tank 6.74 percent. Ghalemdi Hydro Ltd, Ngadi Group Power Ltd and Janautthan Samudayik Laghubitta Bikas Bank, meanwhile, declined over 4 percent apiece. Other losing scrips for the day include Suryodaya Laghubitta Bittiya Sanstha Ltd, Synergy Power Development Ltd and Nadep Laghubitta Bittiya Sanstha Ltd.
As per the ARKS technical analysis, the market has reverted back to its winning run with two consecutive bullish candlesticks formation. Technical indicators also indicate the market gaining momentum with Relative Strength Index (RSI) tilting upwards and Moving Average Convergence Divergence (MACD) crossing the neutral line towards positive territory. The index has also bounced from its 50 day Exponential Moving Average (EMA) making further upward movement likely. The immediate resistance for the equity market stands at around 1,200 points mark.